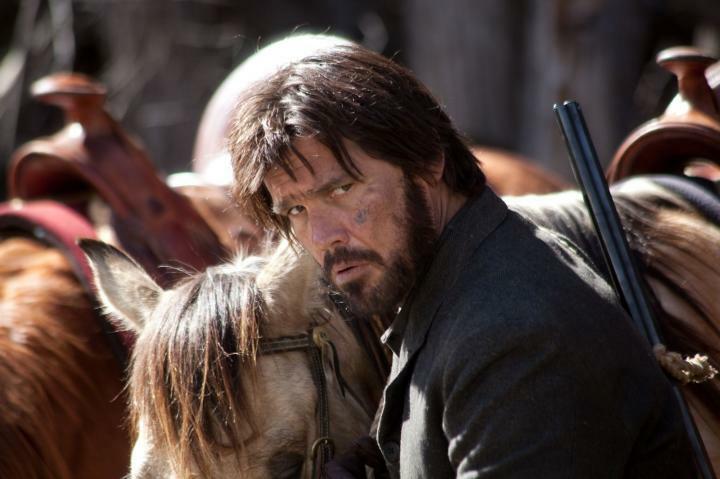 The original True Grit might have been eclipsed by John Wayne’s larger-than-life persona, but the Coen brothers’ remake is an ensemble piece that feels freshly their own. Joel and Ethan Coen have pulled off an impressive feat: repurposing a classic film with their idiosyncratic blend of dark, deadpan humor and palpable suspense, while remaining ultra-faithful to the novel. In fact, their elegant version, with its distinctively formal dialogue, hews more closely to Charles Portis’ book than the 1969 film. “True Grit,” one of the most entertaining American novels of the last 50 years, came out in 1968. One year later, Hollywood set out to subvert it. U.S. Marshal Rooster Cogburn, the bushwhacking alcoholic without a friend in the world, was tailored to fit John Wayne’s more heroic frame. Fourteen-year-old Mattie Ross, the Arkansan who hires him to catch her father’s killer, was played by 21-year-old Kim Darby. LaBoeuf, a laconic Texas Ranger chasing that killer for another crime, was embodied by callow Glen Campbell. Those of us who admire Charles Portis’ novel have waited 40 years for a screen version that’s as literal as possible – and the Coen brothers just about deliver it. 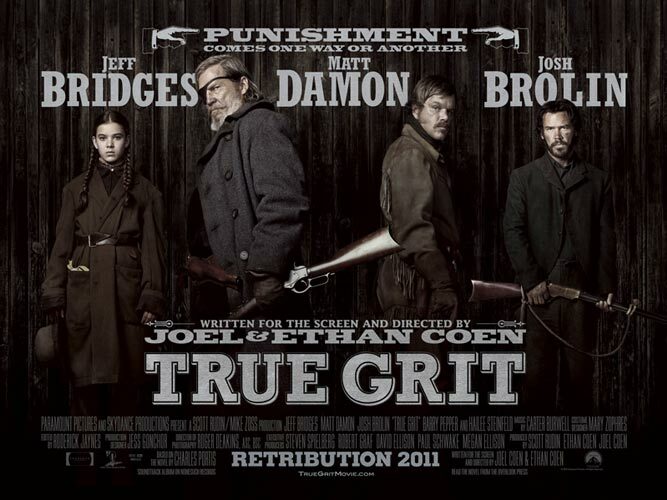 Most of the good lines in this truer “Grit” come from the novel – maybe all of them do – and the few missteps come from the Coens’ attempts to make the book funnier or keep the narrative more in line with a traditional movie archetype. 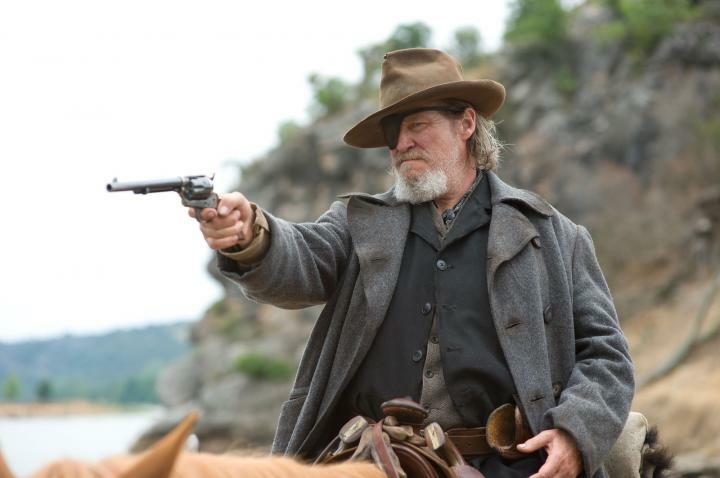 This is Bridges’s first film with the Coens since he played The Dude in The Big Lebowski (1998) – his own iconic role. It strikes me that John Goodman, his co-star in that comedy, might’ve made an even better Cogburn, but he’d also have invited greater comparisons to Wayne. As it is, Bridges’s unflappable Rooster is more Dude than Duke. There are other aspects of the movie that have a distinctive Coen flavour. An early scene involving the hanging of three men in Fort Smith employs some literal gallows humour of the kind we’d expect from the duo. Then there’s that quirky interlude with the bearskin doctor (Ed Corbin), which is a morsel of pure Coenesque eccentricity. 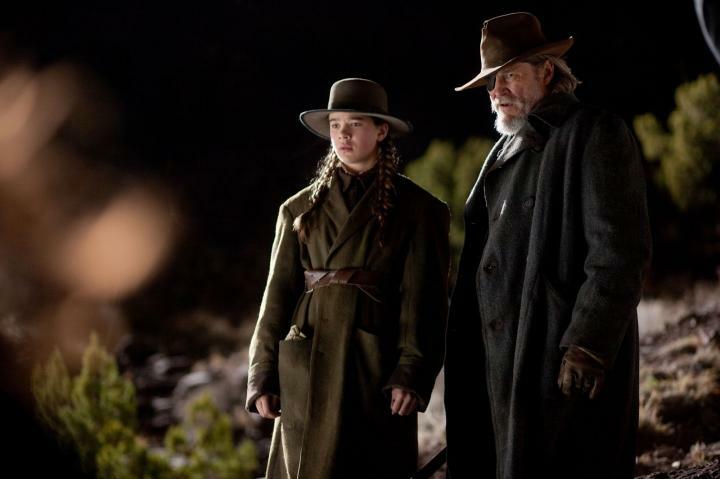 Their reverence for movie genres is also on display, particularly in the John Ford-style open-range cinematography of their regular lensman, the superb Roger Deakins. We get plenty of vast, snow-glazed landscapes and country night skies peppered with stars. As remarkable as the great outdoors are, it is this play with language, richly delivered by Bridges, Damon and Steinfeld, that is the star of the show in True Grit. Apart from being very funny, there is a musicality to the mannered, olde tyme talk. Steinfeld in particular delivers paragraphs of speech replete with SAT words, Latin phrases and sharp entendres. Not since Tom Hanks’s G.H. Dorr, PhD, from the underappreciated The Ladykillers have the Coens’ love of verbiage found such a worthy delivery method. People who love Charles Portis’ 1967 novel True Grit — and you will know them when you meet them, even if they do not wear an eyepatch and do not forego the modern convenience known as the contraction — love it with a fierceness that shouldn’t be crossed. Joel and Ethan Coen must have known what they were getting themselves into when they set out to adapt it. If they’d failed to capture the tone and flavor of the book, or messed with too many of its roughhewn details, the mark of shame upon them would be too great to bear. Opens: Friday, Dec. 24, 2010.
great movie . last month i have got dvd in renter store . i love this movie.